I went through my first two pregnancies completely unaware that there was such a thing as pregnancy tea or even the very basic red raspberry leaf tea. I wish I had but of course there’s no changing the past. With my third and fourth pregnancies I learned about red raspberry leaf tea and all it’s benefits. Red raspberry leaf tea by itself is an amazing thing to drink during pregnancy. I have a whole post devoted to it but in short, it helps make contractions more effective once they do start because the tea helps tone your uterus. Although I do want to point out that red raspberry leaf is most effective in helping shorten the second stage of labor… so you could have a long labor but the hardest parts will be shorter with the use of red raspberry leaf tea. Sometime in between my fourth and fifth pregnancy, I started getting into other herbal teas. 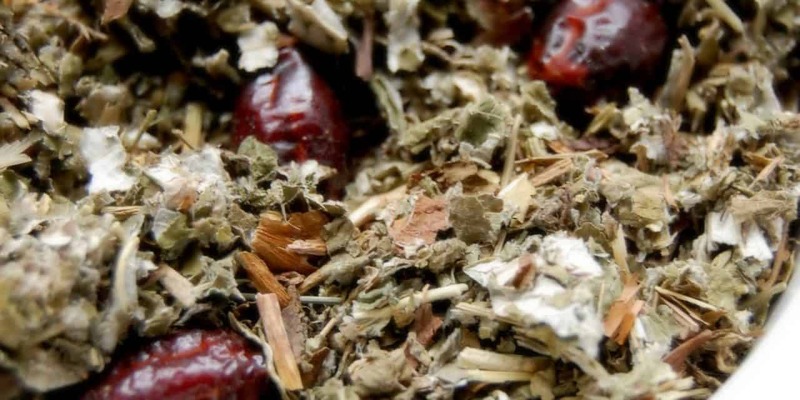 I learned that there are some herbs out there that are just truly amazing and there’s a reason why companies add them to their pregnancy tea blends. 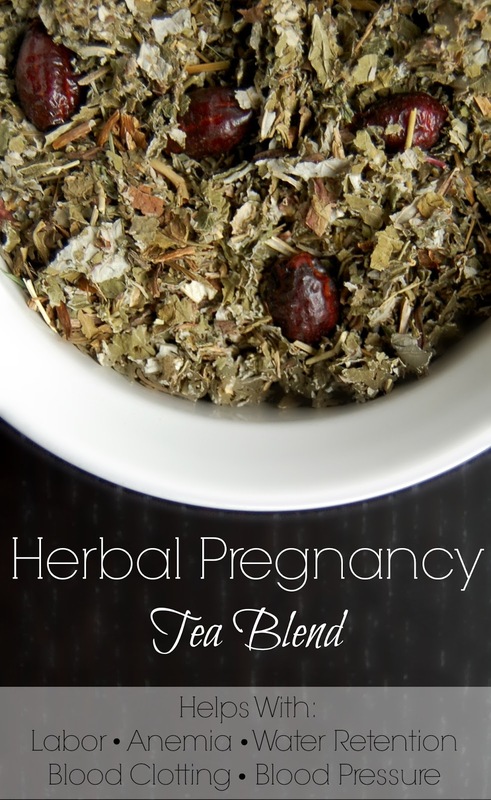 Now there are many herbs that are wonderful for pregnancy but I tend to like to keep things simple so I have a minimal pregnancy tea blend. As I mentioned, red raspberry leaf is the pregnancy tea. 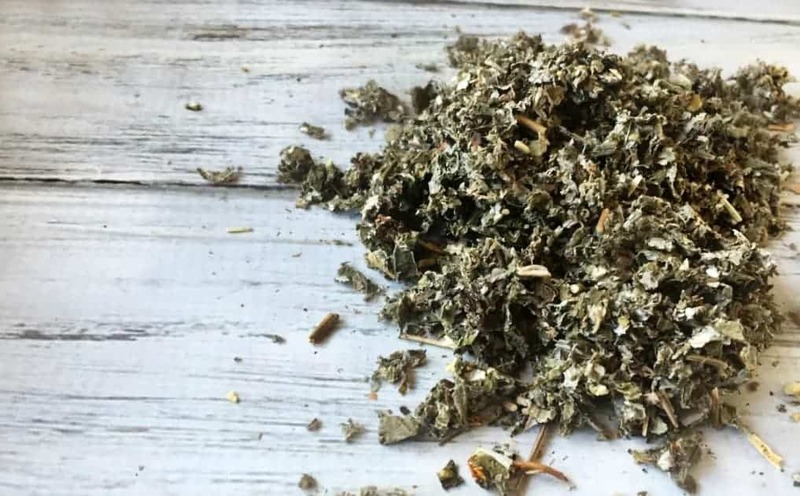 If you are to use just one herb, this would be the one to choose. Red raspberry leaf helps with relieving nausea, toning the uterus so your contraction are more effective (please not that it does not start contraction; it simply makes them more effective once they do start), and helps with postpartum bleeding. Dandelion leaf is a great purifier of the blood, liver, and kidneys. What makes it extra beneficial during pregnancy is its ability to help with anemia, blood pressure, constipation, water retention, and blood clotting. I’ve also heard that dandelion can help normalize blood sugar levels which is great if you are worried or dealing with gestational diabetes. 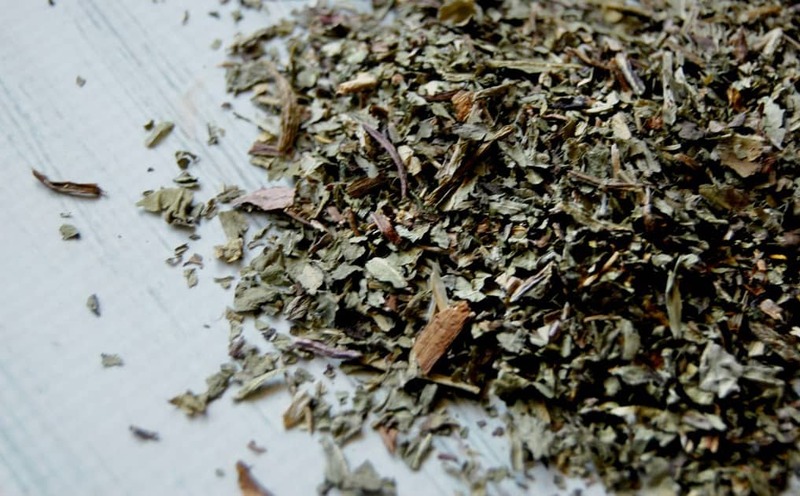 Usually you would find nettle in a pregnancy tea blend but I choose dandelion leaf. Why? Well as it turns out dandelion is actually higher in iron and vitamin K than nettle (which is usually why it’s used). Dandelion is also high in vitamin A , calcium, and potassium. Rose hips are the fruit of roses. Can help dealing with stress, boosting immunity, water retention, and also helps with iron absorption. They are a great source of vitamin C. In fact, rose hips are one of the richest vitamin C sources! They are contain: vitamin E, vitamin A, vitamin K, and manganese. Single Cup – Add 1 tablespoon of tea blend into 1 cup of just under boiling water. Let steep for at least 10 minutes. Remove tea leaves, sweeten if desired and drink. Large Batch – Bring 10 cups of water to just under a boil. Add entire amount of pregnancy blend, let steep at least 10-20 minutes or overnight. Strain the leaves, store in the refrigerator. Drink 1 cup of tea per trimester each day. (1 cup/day in 1st trimester, 2 cups/day in 2nd trimester, 3 cups/day in 3rd trimester). Many doctors and midwives actually prescribe red raspberry leaf tea in the 1st trimester for miscarriage and morning sickness. However to be on the safe side, you can simply choose to avoid drinking the tea until you are in your 2nd trimester. Use a tea ball to strain the leaves. For making large batches (or if do not have a tea ball for small batches) I like to use a piece of muslin to strain my tea. Many people can drink tea without any sweeteners but I prefer my tea sweet. 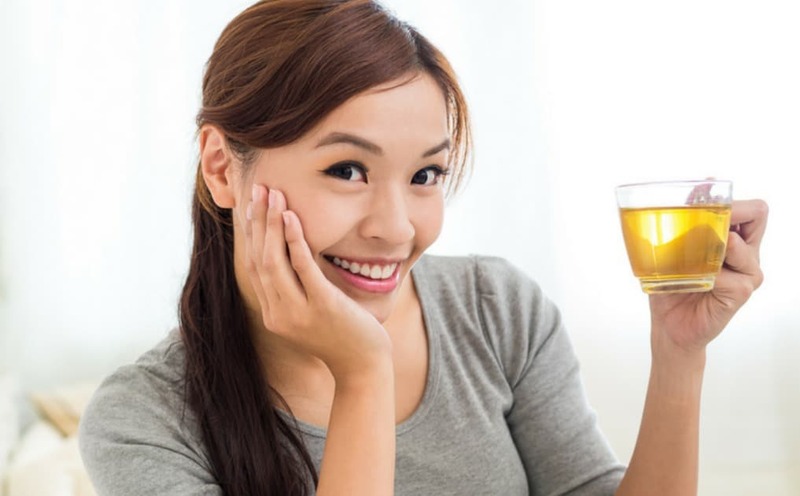 Since you will be drinking so much of this tea, I do recommend avoiding the classic sugar route and instead choosing a natural sweetener such as honey or stevia. This looks great! I wanted to try pregnancy tea during my last pregnancy but could never get it together enough to figure out what I actually needed. I will definitely be trying this during my next pregnancy! Thanks for sharing this recipe. I’m 19 weeks pregnant and have just had my first cup of this blend. Very nice! A much milder flavour than expected. How strong should the flavour be? I’ve had raspberry leaf tea before that was horribly bitter but this one was so mild I didn’t even need sweetener. I hope my herbs are ok. I let it steep for 15mins. Sounds like you made it just fine. I’ve found a few variations in my herbs so sometimes my tea will range in flavor (I once had a bag of RRL that smells like cherry syrup and I’m still not sure what that was all about!) RRL usually reminds me of a mellow black tea for some reason. The additional herbs can help change the flavor a bit too. I wish I had thought to add more herbs to my pregnancy tea! Mine was just raspberry leaf. The dandelion and rose hips would have been a great addition.